Áilleacht. Cad is áilleacht ann? Aoibh an gháire atá ar do bhean chéile? Gan amhras. Do pháistí? Ar ndóigh. An radharc siar ó Dhoire’n Chuillin? Cinnte. Tá liosta gairid de nithe sa tsaol seo a chreidim-se iad a bheith ‘álainn’. Chuireas mír amháin eile leis an liosta gairid sin ar maidin. 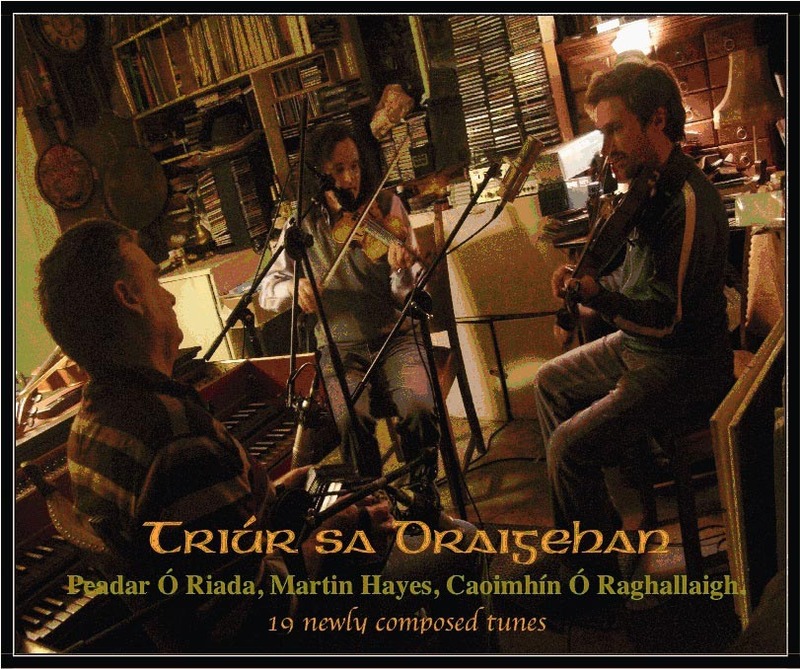 ‘Triúr Sa Draighean’ an dhluth cheirnín nua ó Pheadar Uí Riada atá ag seinnt a chuid ceoil féin ar an albam in éineacht le Martin Hayes agus Caoimhín Ó Raghallaigh, beirt bhfeidhleadóir nach gá a chur in aithne is ar éigean. Níl ach cúpla rian cloiste agam go fóill – Tráthann an Taoide, amhrán – agus táim ag éisteacht le ‘N’fheadar’ faoi láthair. Tá an ceol chomh milis is chomh gar don ghnámh ag an am chéanna is ar éigean go bhfuilim ag scríobh ach go bhfuil mo mhéara ag rínce ar an mhéarchlár. Cé gur ceoltóir é Peadar a sheineann go leor ionstraimí, is an consairtín is mó a sheineann sé ar an albam seo. Ach tá go leor ionstraimí eile le clos anseo freisin – tambura ón Ind ar ‘Tráthann an Taoide’ mar shampla, uirlis a thugann ghné ón domhan eile go píosa filíochta atá ag plé go díreach leis an dtaobh eile. Dónal Ó Liatháin, m’athair nach maireann, a chum focail ‘Tráthann an Taoide’ ar iarratas ó Pheadar a raibh ag lorg dán le cur le fonn neamh ghnach a bhí cumtha aige féin. Píosa é, idir ceol agus filíocht, a cumadh in onóir do Dhiarmuidín Ó Shúilleabháin, amhránaí, iriseoir agus ball de Chór Chúil Aodha, a cailleadh go tubaisteach i dtimpist ghluaisteán. Ní h-é an t-aon bhall den Chóir a cailleadh go ró-óg agus bhí píosa ag teastáil chun cuimhne ár gcomrádaithe go léir a chuaigh romhainn a thabhairt chun cuimhne agus a chomóradh. Tá an píosa, “Spórt/Fiach”, anois á sheinnt – fidil agus feadóg stáin. Píosa lán le spraoi é seo a mheallann an éisteoir le laethannta na leanbaíochta a thabhairt chun cuimhne. Tá naoi fhonn deag ar an sé rian deag ar an albam seo. Albam é a sheasfaidh an fhód mar sheod d’ár gcultúir é ar feadh na mblianta romhainn – ach ná bac liomsa, téigí amach agus ceannaigí é agus tugaigí cluas do sibh féin. Rud amháin eile a dhéarfaidh mé, go bhfuil píosa ceoil ar leith ar an albam tiomnaithe do Bharack Obama, Uachtarán nua thofa Mheirceá. De réir an eolais a thug Martin Hayes do Pheadar, bionn babhta aclaíochta ag an Uachtarán gach maidin agus é ag éisteacht le ceol ar an iPod lena linn. An rian deireannach a bhionn sé ag éisteacht leis, is é sin rian de chuid an banna ceoil ‘Lúnasa’. Mar sin de is léir go mbaineann sé taithneamh as cheol traidisiúnta na hÉireann agus chreid an Triúr go mba chóir doibh píosa ceoil a chumadh do chun é a chur ag rínce. Chreid siad gur cheart go mbeadh sé ina rínceoir maith ós rud é gur mhothaigh siad go raibh an éirim sin ann. Ní fheadar an mbeidh éinne ábalta an píosa ceoil sin a sheoladh chuig Barack Obama le go mbainfeadh sé triail as. Tá sé cloiste agam agus is ríl gleoite atá ann….ach ní h-aon rínceoir mise! Foilsiú: 30/04/2010 . igaeilge a d’fhoilsigh. Ranganna: An Ghaeilge, Cultúr. Clibeanna: Barack Obama, Caoimhín Ó Raghallaigh, Dónal Ó Liatháin, Diarmuidín Ó Suilleabháin, Martin Hayes, Peadar Ó Riada. Is cosúil go mbeidh ré nua i gcúram sláinte i Stait Aontaithe Mheircea ar cheann de na mhór bheartais a fhagfaidh Barack Obama mar oidhreacht nuair a chriochnóidh a sheal sa Teach Bhán i gceann trí bliana nó, b’fhéidir, seacht mbliana. De réir an eolais atá againn ar an bpacáíste ar votáil teachtaí i dTeach na dTeachtaí 219-212 ar a shon inné, ní bheidh cead ag comhlachtaí arachais seirbhís a dhiultú ar dhaoine le ‘pre-existing conditions’. Beidh ar gach fostaí arachas sláínte a bheith acu faoin reachtaíocht nua. Is cinnte nach bhfuil deireadh leis an argóínt go fóíll agus go bhfuil Pairtí Phoblachtánach Mheirceá, atá go mór i bpóca na gcomhlachtaí arachais sláinte, chun leanúint leis an bhfeachtas i gcoinne na mbeartas seo. Inniu, áfach, tréaslaim leis an Uachtarán Obama agus tabhairt faoin fhadhb seo a réiteach. Ní réiteach foirfe é seo – ach tá clochmhíle stairiúil sroichte ag an Uachtarán agus d’eirigh leis i slí nár eirigh le Teddy Roosevelt roimhe. Dá mbeadh ceannairí leis an gcnamh droma céanna acu ar an dtaobh seo den Atlantach, ní bheadh an easpa cinnireachta a mhothaímíd faoi láthair ag cur as dúinn. Tuilleadh faoi seo ar ball. Foilsiú: 22/03/2010 . igaeilge a d’fhoilsigh. Ranganna: An Ghaeilge, Cúrsaí Reatha. Clibeanna: Barack Obama, Sláínte. Czar na Gaeilge – cé bheadh ann? Le linn an chíor thuathail ar fad le seachtain anuas sa Bhreatain agus Gordon Brown le cos san uaigh agus ar tí bheith caite isteach ag a pháirtí, bheartaigh sé Alan Sugar, réalt ‘The Apprentice’, a fhostú mar Czar Fiontraíochta. Is é an tUasal Sugar an Czar is déanaí atá fostaithe ag ceannairí Rialtais chun tabhairt faoi dhúshlán ar leith. De réir dealraimh séard a dúirt John McCain le déanaí faoin Uachtarán Obama, go raibh níos mó Czar ag Uachtarán SAM ná mar a bhí ag teaghlach Romanov na Rúise. Bhí 18 acu – tá 20 ag Obama. Ag an am chéanna, is tuairim é arbh fhiú é a thriail chun saol na Gaeilge a shuathadh. Duine cumasach a aimsiú chun rudaí a chur ag gluaiseacht sa treo ceart agus ag gluaiseacht go tapaidh sa treo sin. Ní bheadh an fheidhmeannach seo ceangailte le maorláthas agus bheadh buiséad neamhspleach aige nó aici, buiséad substaintiúil. Cé h-é nó h-é an duine a roghnófá don phost sin, dá mba rud é gurb é sin ceann de na moltaí ar tháinig as an bPlean Gníomhaíochta don Ghaeilge atá le foilsiú go luath, sara ndeinfear athshuathadh ar an gComhaireacht pé scéal é! Agus go mbeadh sé i gceist na moltaí sa Phlean a chur i bhfeidhm, a deirim sotto voce! Foilsiú: 09/06/2009 . igaeilge a d’fhoilsigh. Ranganna: An Ghaeilge, Cúrsaí Reatha. Clibeanna: Alan Sugar, Éamon Ó Cuív, Barack Obama, Czar, Gordon Brown. An chaint úd i gCairo…. Tá sé deacair a shamhlú, i ré seo an ‘soundbite’, go bhféadfadh oráid ó pholaiteoir bheith spreagúil, géar chúiseach agus dea thomhaiste. Ach is iad san – agus eile- na deathréithe atá á lua leis an gcaint a thug Barack Obama, Uachtarán Stait Aontaithe Mheiriceá, i gCairo inniu agus é ag iarraidh tús a chur le caidreamh nua idir SAM agus an domhan Mhuslamach. Ní Muslamach mé – ach creidim gur eirigh leis an Uachtarán Obama aghaidh a thabhairt ar na gceisteanna tabhachtacha agus na lochtanna a bhí ar an dhá thaobh go h-eifeachtach agus i dteanga cúramach ach firinneach ag an am chéanna. An mó uair a éisteann tú le polaiteoir agus iad ag ‘going forward’ agus a leithéid agus go dtuigeann tú go bhfuil sé nó sí i gcaint nach dtuigeann eisteoir nó cainteoir? B’fhéidir go mbeidh mé ábalta teacht ar leagan físe den chaint ar Youtube ar ball – go dtí seo, is féidir an oráid a léamh i gcló anseo. Foilsiú: 04/06/2009 . igaeilge a d’fhoilsigh. Ranganna: Cúrsaí Reatha, Nuacht. Clibeanna: Barack Obama, Ioslamaigh, SAM. Seo mise ag spáisteoireacht timpeall an idirlín agus fuaireas alt bhrea, agallamh le hUachtarán SAM, Barack Ó Bama, le fear ón New York Times. Bhíos ag léamh liom nuair a thugas faoi ndeara fogra ar thaobh an leathnaigh. Ní fhéadfadh sé sin bheith ann….d’fhéachas arís, níos géire an dara uair. Ghlacas cúpla griangraf den leathnach ar an scaileán – bhí eagla orm nach gcreidfí mé dá ndéanfainn é a thuairisciú anseo ar iGaeilge. 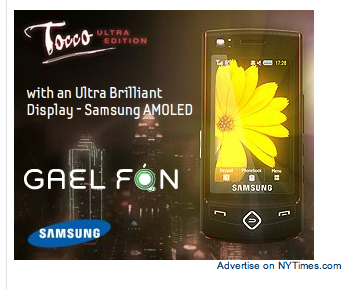 Fogra d’fhón phoca Samsung, ár sean chara Gaelach, an Tocco, os comhair mo shúile ar leathnach [idirlín] de chuid an IrishNew York Times! A leithéid de radharc. An rara avis cinnte! Ní doigh liom go bhfaca mé a leithéid ar leathnaigh an Irish Times fiú. Nach é seo an New York Times céanna ina raibh díspeagadh ar an nGaeilge le linn mhí na Márta, nuair a thug Brian Cowen ar Barack Obama le h-aghaidh Lá Fhéile Phádraig! Rinneas tagairt do anseo agus spreag mo chuid tuairimí ar an gceist ar bhlar dhiospóireachta an NYT féin roinnt aischothú feargach ó thrachtairí éagsúla. Ní thuigim cé acu an bhfuil níos mó airgead ná ciall ag lucht Samsung agus go bhfuil siad ag ceannach fograí ar leathnaigh idirlín an New York Times don ghaelfón? An amhlaidh go gceapann siad go mbeidh corr Ghael fánach ag léamh na leathnaigh seo agus go rithfidh siad amach chun an fón a cheannach. Sa chás seo bhí an Gael corr agus fánach seo ag léamh an leathnaigh – ach ar droch amharaí an tsaoil, tá Tocco agam theana féin. Nó an é go bhfuil bogearraí chomh cliste sin ag an New York Times go n-aithníonn siad gur Éireannach mé, le suim sa Ghaeilge, agus go bhfuil an fogra seo á threorú i mo threosa. Mas amhlaidh an scéal, nár cheart go mbeadh eagla orm. Sin cumhacht theicneolaíocht na faisnéise duit. Sin cumhacht lán stad. Tar éis é sin go léir, chuas ar ais go dtí an leathnach arís. Bhí sé druidte agam agus bhí orm é a athlódáil. Bhí an fogra don Ghael Fón imithe agus ceann eile ina áit. B’fhéidir gur mearú súl a bhí ann. Ach féach ar na griangrafanna arís. Tá sé ann. Ní mearú súl – agus níor dhein mé ‘Photo-shopáil’ air ach an oiread. Cás é seo don tUasal Ó Ripley, creidim! Foilsiú: 30/04/2009 . igaeilge a d’fhoilsigh. Ranganna: An Ghaeilge, Cúrsaí Reatha. Clibeanna: Barack Obama, Fógraíocht, Gael Fón, New York Times, Samsung, Tocco. Is cosúil go bhfuil Barack Obama earcaithe ag gluaiseacht na Gaeilge le cuidiú linn sna fiontair agus na beartais éagsúla atá idir láímhibh againn. Nuair a luaigh mé an tseachtain seo chaite go raibh ceacht Ghaeilge faighte aige ón Taoiseach, Brian Cowen, an tseachtain seo chaite ag an ocáid sa Teach Bhán ar Lá Fhéile Phádraig, nior thuig mé go h-iomlán na feidireachtaí. 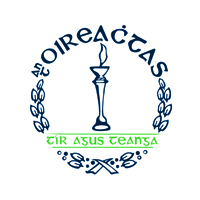 Seo an úsáid a bhain dream nua atá ag iarraidh Gaelcholáiste nua a bhunú i ndeisceart Bhaile Atha Cliath as na focail draíochta sin, ‘Is Féidir Linn’. Is maith liom é agus tá sé cliste – tá ár dtacaíocht tuillte aige. Foilsiú: 23/03/2009 . igaeilge a d’fhoilsigh. Ranganna: An Ghaeilge, Cúrsaí Reatha. Clibeanna: Barack Obama, Deisceart Bhaile Átha Cliath, Gaelcholáiste.